Harworth Colliery gave themselves a glimmer of hope of avoiding relegation by running out deserved 2-0 winners at home to Glasshoughton Welfare. Second half goals from Chris Lovett and Mason Barlow earned Colliery their first win under new boss Craig Spink. The victory ended a run of four straight defeats and lifted Harworth off the foot of the Division One table. Colliery, who were promoted from the Central Midlands League last season, remain seven points adrift of safety with eight games remaining. Their game was one of only four NCEL matches to go ahead on a rain decimated weekend. “We had a few new faces in and I thought we thoroughly deserved the three points,” said Spink. “Conditions didn’t really suit us. “We continued to play even in 50mph winds and create chances. We stuck to our game plan. “I thought the lads were outstanding and continued to press and put pressure on them for 90 minutes. 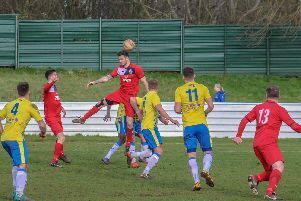 There was little to choose between the teams in the first half with Harworth having a strong shout for a penalty, while home goalkeeper Jamie Hooley was forced into an excellent save by Matt Semely. Harworth made the all important breakthrough on 49 minutes with a well taken goal by Lovett. They doubled their lead six minutes later from the penalty spot. Lee Edmondson was brought down just inside the area and Barlow calmly sent the goalkeeper the wrong way. Barlow almost made it three on the hour mark but his effort was blocked and Lovett’s effort on the follow-up was saved. Colliery have a very winnable home game this weekend against 14th placed Shirebrook Town, who have won just one of their last nine.